Well, now I know why Jenn said she was pleased the rack was functional - apparently it took a serious fall. One wheel broken in half, two wheels bent, a huge dent in side... its a miracle the servers survived. I can't imagine what happened to the rack, I'm thinking it took a 6-10 foot fall. However, everything in the rack is functional and the booth looks fantastic. It's the same design as the one we had at Interop in New York, but instead of having the columns and header wrapped in vinyl, all the surfaces are rigid panels with art on them. Today was pre-con day at DevConnections, with full and half day workshops. Its ends with a dessert reception and the opening of the tradeshow floor for two hours. 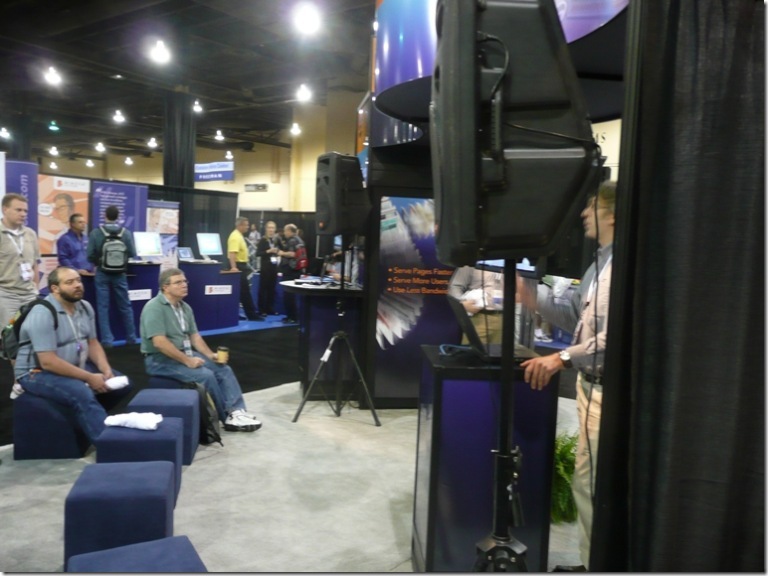 Here's an odd shot of the booth, you can see the rigid panels with art work on them on the far column. Kent is doing a presentation. I definitely did not take enough pictures of the booth this time around. For two hours, we were run off our feet - everyone is interested in Strangeloop and the AS1000. It was all we could do to hand out datasheets fast enough!